Acoustic communications are able to transmit multimedia data and sound simultaneously. 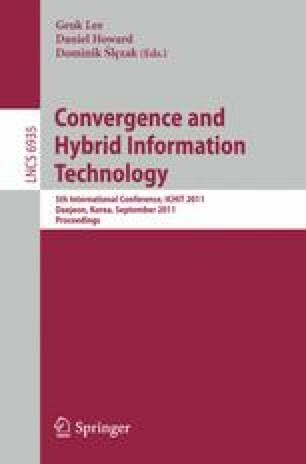 But, there is a problem about low data throughput because of narrow frequency band of audible sound in acoustic communication system In this paper, we propose an acoustic multimedia data transmission system with multiple-input multiple-output orthogonal frequency division multiplexing (MIMO-OFDM) for high data rate in acoustic communication system. We compare the receive performance of the proposed system with the existing system with single-input single-output (SISO) by experiment. The data rates of SISO and MIMO system are 4.9 kb/s and 9.1kb/s respectively, with QPSK modulation, no channel coding, and about 3.5 KHz data frequency bandwidth. We ensure that the data throughput of the proposed system is increasing approximately 80% than SISO system. But the proposed systems need more Pilot SNR about 2dB than SISO system to satisfy the BER performance of 10e-3. In other words, we can dramatically increase data throughput of acoustic communication system with MIMO but receive performance is a little decrease.